How do I save my ClickBank IDs so they appear in the 'Create a HopLink' window? 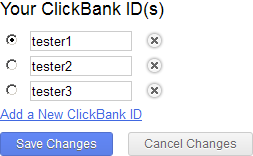 You can save your ClickBank IDs, so you don't have to enter them each time you create a new hoplink. To do so, open the 'Account Settings' page (click on such link at the top left corner). Click on the link 'Add a New ClickBank ID' inside the 'Your ClickBank ID(s)' block. Repeat steps 2-3 for each of your ClickBank IDs. Activate a radio-button in front of your default ClickBank ID. Press the 'Save Changes' button.